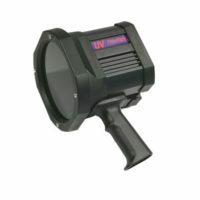 The Labino Torchlight UVG3 is a LED torch designed with a unique filter for applications where the amount of visible light is critical, such as non-destructive testing. The filter eliminates the white light from the lamp as well as reduces the glare illuminating aluminum when you use the lamp in combination with UV block goggles. UVG3 torch reach full power instantly. The on/off button is positioned at the back of the lamp to prevent accidental activation. The length of the lamp is 6.3 inches (15.9 cm) and weighs 211 grams (7.4 oz), including battery. The torch contains one ultraviolet light emitting diode (LED) that peaks at 365 nm. The life of each LED is estimated at 30,000 hours. The battery has a running time of 3 hours (+/- 5%) and can be recharged from a normal electrical outlet or a vehicle cigarrette lighter socket. The torch is also equipped with a current regulator that keeps the UV intensity constant even when the battery fades. Certifications: IP65 approved for dust and temporary water jet.